I remember snippets of that day. I had a nagging feeling that I should relocate my pill minder to a higher shelf, but I didn’t do it. I was in the bathroom with a stomach bug when my then-5-year-old came screaming up the stairs. My whole world stopped in that moment. My toddler, just 15-months-old at the time, had gotten into my weekly pill minder and chewed up some of the colorful pills. By the time I got to her, all that was left was a bright blue smear under her bottom lip. I called poison control and then 911. An ambulance came and took us to the hospital. I never thought to pray during the whole ordeal, but luckily, our gracious God gave me the peace that passes all understanding that day. I knew my baby would be okay. At the hospital, she had to drink charcoal. In the middle of the drink, she lost consciousness. There was a time when no one was sure what would happen. The police officers took all my information as if I were a criminal. My baby woke up smiling, black milkshake still smeared around her mouth. We left the hospital wiser but no worse for the scary events of the afternoon. I am thankful for God’s great plan. I am thankful that He knows what is to come and that it is all for the good of those who love Him. Scary moments happen in our lives. There’s nothing we can do to stop them. Kids get into things they shouldn’t. They wander off in stores. They fall down and break bones. If we’re lucky, they get found or put back together without permanent harm. How do you handle the scary moments of motherhood? Our kids get scared, too. How do we reassure them when we know too well that the world can be a scary place? 1. Devotions. Through your daily devotions, remind your children that God is always there, looking out for us in every situation. 2. Memorizing scripture. Teach your children verses like Romans 8:28 and Joshua 1:9. 3. Read reassuring books like It Will Be Okay. 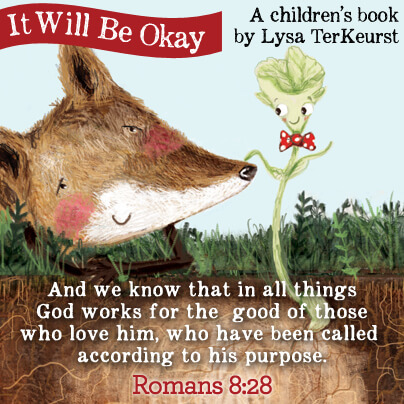 Books like these can bring just as comforting to parents as they do to our kids. Sometimes hearing the reassuring message the God is good in the simplest terms is just what we need. 4. Pray. Teach your children to rely on God’s peace and understanding in moments of crisis. This entry was posted in Blog and tagged Fear, It Will Be Okay, Motherhood, Parenting by Tara Ziegmont. Bookmark the permalink.